Malcolm Turnbull will have to work out how best to handle Pauline Hanson and One Nation before the next federal election. For the national narrative, perhaps the most notable story out of the Western Australian election revolves around Pauline Hanson and Malcolm Turnbull. Despite the backlash from WA Liberal voters over the now-infamous preference deal the party did with her, Turnbull on Sunday wouldn’t rule out the Liberals playing footsie on preferences federally, deflecting questions by saying it was a matter for the party organisation. Turnbull surely must be uncomfortable with his line. This would seem to be yet another area where he is not being true to his personal values. It must add to the confusion of voters wondering about the “real Malcolm”. Hanson has come out of the WA election with her very ragged petticoats on display. One Nation did much worse than it was polling early in the campaign. Expectations were high. On Saturday night Hanson was lamenting the preference deal, while trying to wriggle out of blame for the likely impact of her irresponsible comments on vaccination. This was a polarising election – people were about changing the government, not just registering a protest. While Hanson’s WA vote was very low in aggregate, in the three non-metropolitan regions for the upper house One Nation polled (on the count so far) between 9% and 14%. In the Legislative Assembly seats with One Nation candidates, it polled about 8%; in the lower house seats it contested outside Perth it polled 9.6%. ABC election analyst Antony Green says the preference deal delivered nothing to the Liberals, but has brought One Nation an upper house seat in the south-west region and potentially a second seat, in the mining and pastoral region. Regardless of her poor performance, Hanson continues to present a challenge for the conservative parties. The WA result cut her down to size, and the campaign shows how such a party is likely eventually to blow itself up (as it did before). But that could take a while, and in the meantime the damage Hanson can do in the coming Queensland election and – depending on what happens there – the federal election means the debate over how to handle her will continue to rend the conservatives. It took some time for John Howard to muscle up against Hanson two decades ago. Now we see Turnbull remaining equivocal – denouncing some of her stands but courting her as the leader of a Senate bloc and keeping options open on preferences. Any preference deal in Queensland or federally would be quite different from the WA one. It would not disadvantage the Nationals. There is a combined party in Queensland and a coalition nationally (as distinct from the “alliance” that operated in WA). It would be a matter of putting One Nation ahead of Labor. The debate ahead involves not just how the Liberals see their electoral advantage, but a question of principle: given what Hanson represents, shouldn’t the major parties form a united front to try to squeeze her out of existence – which means placing her last or, for the Liberals and Nationals, at least behind Labor? The Nationals are clear-eyed about Hanson because she is such a direct threat to them. But they are divided on the best approach to the danger she represents, and are likely to be pragmatic about preferences. It is notable that the Nationals vote in WA held up relatively well (though the fate of their leader Brendon Grylls is uncertain). The same happened at last year’s federal election; the Nationals are often closer to feeling on the ground than the Liberals. Turnbull is right that the thumping WA loss is overwhelmingly about the local scene. If the federal government was doing well, the main impact of the result would be having to deal with another state ALP government. But when you are in deep trouble, it’s another matter. The WA defeat will add to the jitters on the backbench; it is an object lesson in how fierce the voters can be when they turn against a government. You can be sure also that Turnbull’s enemies within his own ranks will find ways to turn this latest Liberal bad news against him. Meanwhile Bill Shorten is seeking – without the slightest evidence – to segue from the state result to the federal battlefield by claiming that a reaction to Turnbull’s “absolute refusal to stop the cuts to penalty rates” was one factor. 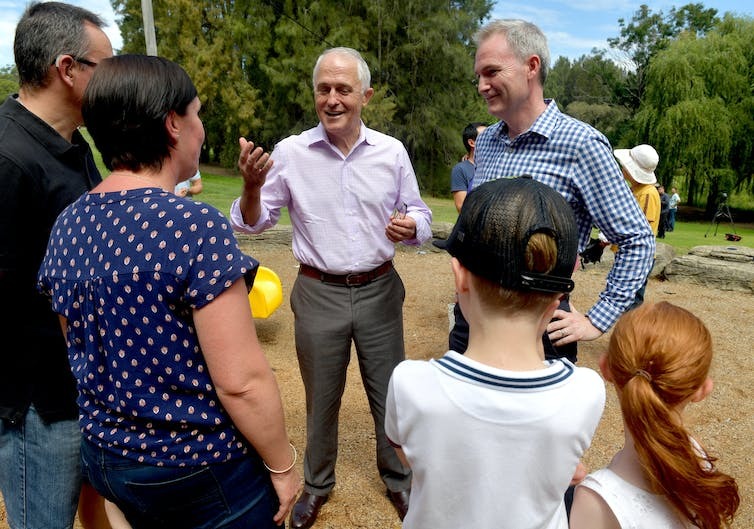 Morale is vital in politics, and just as the federal Liberals will be discombobulated by the WA result, so federal Labor will be encouraged. In Labor there is confidence the tide is moving its way. Strategists believe Queensland can be held at the state election. For Shorten the message from WA is that a steady leader, albeit without charisma but with a united team and an acceptable message, can win when the electorate has become disenchanted with the government. Circumstances are different federally from WA, where the economy and the electorate are suffering from the post-mining boom shocks. But what’s common is a struggling government, a budget in the red, and a leader who has become unpopular. Going for Turnbull is that he has time – two years – before the voters get a chance to declare “time’s up”. The question for him is how to best use that time.